Cipher: Lucina Promo Card in Dengeki Nintendo! There’s at least one more Fire Emblem Cipher promo this set! 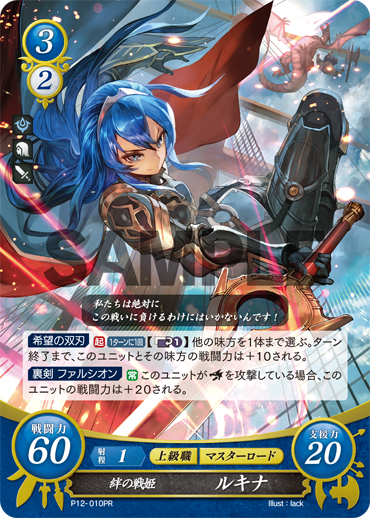 A new Lucina Promo Card is included in the latest edition of Dengeki Nintendo. The June issue of Dengeki Nintendo releases this Saturday, 21 April. Each copy of the magazine contains two copies of the promo card. If you’re interesting in snagging it for yourself, you can pre-order the magazine via Amazon Japan. This is very likely the final promo card that will be available for S12. Such cool art for Lucina! S14 is so close yet a little far can’t wait for it! damb flying Lucina’s taking our jobs and seducing our women……..
That’s…an interesting face you got there, Lucy…what’d you do with your haiOH MY GOSH YOUR SPINE!!! That Falchion looks huge compared to her body.